My research focuses on how biodiversity shapes food web dynamics and the consequences for ecosystem functions and services. Previously, I explored this in a long-term forest diversity experiment, using a multi-trophic approach to understand why and how tree diversity influences insect herbivore distributions and the damage they cause. More recently, my work has focused more on avian insectivores and their role in controlling insect pests. Little is known about avian foraging patterns across spatial scales or, indeed, how the important pest control service they provide might be impacted by declines in biodiversity or global change. This topic now forms the basis of my research, working with forest biodiversity researchers to assess avian predation patterns across latitudinal and environmental gradients. Muiruri, E.W. & Koricheva, J., 2016. Going undercover: increasing canopy cover around a host tree drives associational resistance to an insect pest. Muiruri, E.W., Rainio, K. & Koricheva, J., 2016. Do birds see the forest for the trees? Scale-dependent effects of tree diversity on avian predation of artificial larvae. Oecologia, 180(3), pp.619–630. Muiruri, E.W. et al., 2015. 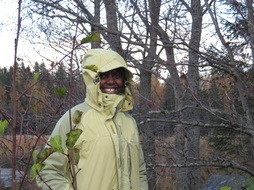 Moose browsing alters tree diversity effects on birch growth and insect herbivory. Functional Ecology, 29, pp.724–735. Barbaro, L. et al., 2016. Avian pest control in vineyards is driven by interactions between bird functional diversity and landscape heterogeneity. Journal of Applied Ecology.